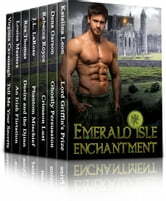 An Irish castle, griffin-shifters, vampires, werewolves and ghosts that go hump in the night. Seven steamy paranormal romance stories with a magical Celtic twist. Love the way the different authors interlink these love stories. Found some more authors books to read. Just love the romance stories. Keep writing. Brilliant didn't want it to end. Would love to visit tullamore castle sometime it sound a fantastic place! Finding where each title intertwined with the others was just as much fun as reading the developing plots and loving the loving! I absolutely loved each and every one of these stories. They all flowed perfectly together and I felt very connected to the magic of Tullamore.